Using a hand saw for the first time! I think it’s important that I incorporate information about our Great Lakes into my teaching because our school is impacted in many ways by one of the Great Lakes (Lake Michigan). Students respond to information that makes sense to them and that affects their life, and because Lake Michigan is so close to us (within 45 minutes); it’s a great way to get students involved in current environmental issues. We can study about aquatic invasive species affecting Lake Michigan and then GO TO Indiana Dunes, for example, and conduct experiments there. Or … even closer to home, we can study about invasive species harming our local forests, and then GO TO nearby forest preserves and volunteer. It’s all about making connections. Studying the Great Lakes topics make science REAL for my students and helps foster natural curiosity about their surroundings. It is also important because the problem of invasive species is a current environmental issue, and it’s happening in our own backyard. It encourages my students to become knowledgeable about factors affecting their living environment and to become activists for change. As of right now, one of my favorite experiences has been my Green Club’s presentation to the Global One Accord group. The leader of that group and I met at the summer workshop presented by Illinois-Indiana Sea Grant. 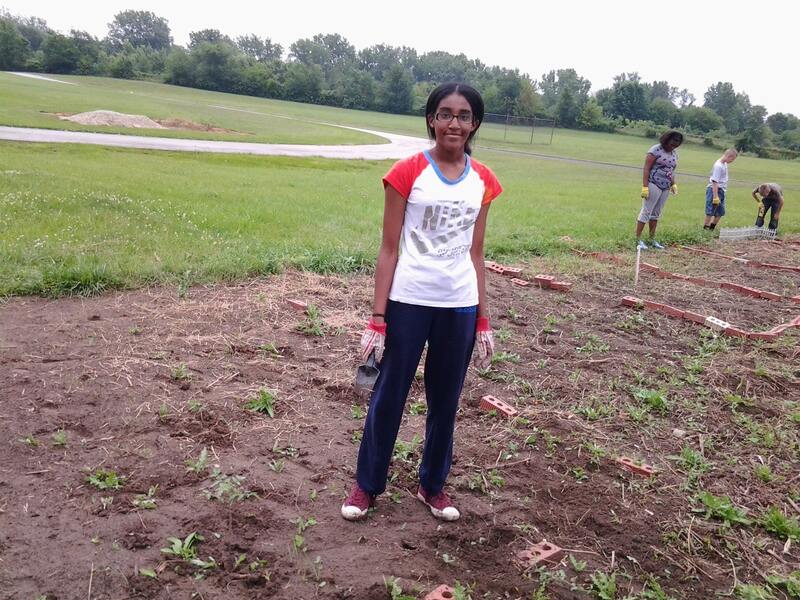 She was starting a community garden, and my Green Club kids were currently growing a large pumpkin garden, as well as taking care of their OWN gardens. So we decided to pool our resources. 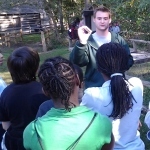 My students took a field trip to her site. It was so invigorating to watch my kids speak intelligently about preparing the soil before you plant; taking care of your gardening tools; ways to naturally prevent bugs from attacking your garden; and how to grow larger pumpkins. 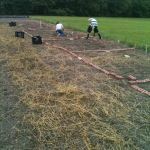 Afterwards, our kids worked together to get her garden beds weeded so that they could plant in them later in the week. It was an excellent experience for my kids because they were able to take information they had learned, and help another group. It fostered leadership skills, gave them experience presenting to a larger audience, and brought us closer as a group. 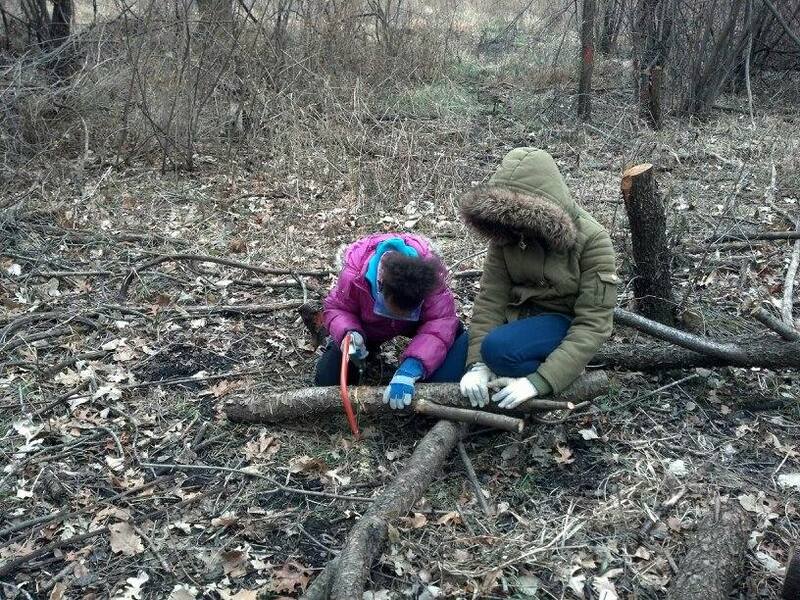 I also took 2 field trips of 80 seventh graders to Sand Ridge Nature Center in South Holland, IL. The idea was to expose as many kids as possible to the nature center, and then, hone in on the kids who wanted to volunteer on a regular basis. I am currently taking classes to become a forest steward because I wanted to learn more about what is available for them to do, and to become more knowledgeable myself. I learned that there are a variety of activities they can participate in. They can remove invasive plants, plant native plants, pick up litter, spread mulch, help in removing overgrown brush and disperse seeds. One of the most useful things I learned is that the Cook Count Forest Preserve offers free bussing to their forest preserves for schools AND free supplies (like gloves, boots, garbage bags, vests etc.). We are definitely taking advantage of that! We went once already to volunteer at Kickapoo Woods, and plan to be regular volunteers at Glenwood Woods (with Howard Swacker as our forest steward mentor). The field trip itself created a lot of memories. It was the first time for many of my students to view a bee hive up close (Sand Ridge has in its nature center), and they couldn’t get enough of it! That made my day…and because of the high interest, it led to a discussion on natural pollinators and how GMO’s are affecting our environment. I enjoyed watching my students pore over fossils, read the information at the stations, and ask the forest preserve volunteers questions about them. Another good memory is how eager some of my kids were to help remove the overgrown brush. How often do junior high age kids get to use hand saws?! 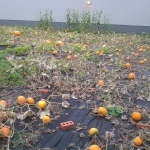 But they were first carefully trained, and then supervised while they cut back part of the overgrown brush … and thoroughly enjoyed the whole process. Of course, not everyone wanted to do it … and that was OK. I didn’t expect them to all do it. But the ones that did couldn’t wait to tell others about it! That’s what education is supposed to be about… finding experiences that inspire and touch individual desires and skills. What I like about this field trip is that they didn’t just walk through the forest preserve. They had the opportunity to speak to an ecologist, learn about important factors affecting our forest preserves and then go further with it if they wanted to. Many of those same students are going to start regularly volunteering this summer at Glenwood Woods. Who knows where it could lead? For some, maybe it will spark a future career in ecology … all because they were given the chance to explore and learn about their local surroundings. Immersion and repetition. I want to immerse my students in the curriculum so that at the end, they have picked up at least the core information. I want them to READ about it, WRITE about it, SEE the issues we’re talking about, VOLUNTEER to help reduce the problems and then, PRESENT about it. With that much immersion, most of the key concepts are going to stick. 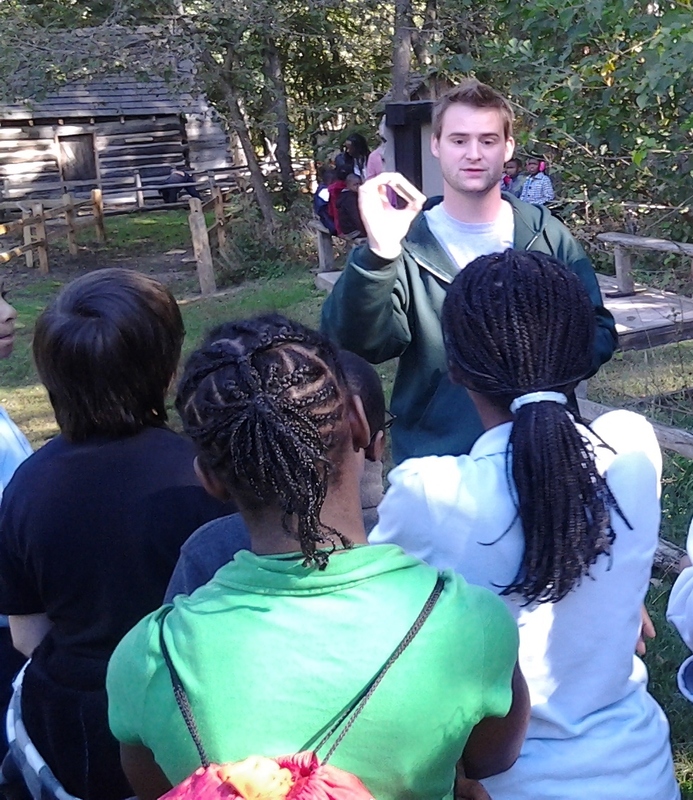 When we visited Sand Ridge Nature center, an ecologist spoke to my students about the restoration activities that are ongoing at Sand Ridge and encouraged them to take an active role in the projects. For the students that choose to volunteer regularly this spring and summer, Howard Swacker (our forest steward), will accompany us on our work days to help educate them on why we are doing what we’re doing, and to answer questions that come up. Grant Program) to speak to all of my classes about water pollution. LaToyia Gilbert (from Global One Accord) worked extensively with her students to research and compile information about how most businesses and families dispose of pharmaceuticals. They came and presented to my students last fall. We hope to do more together with our students in the future. 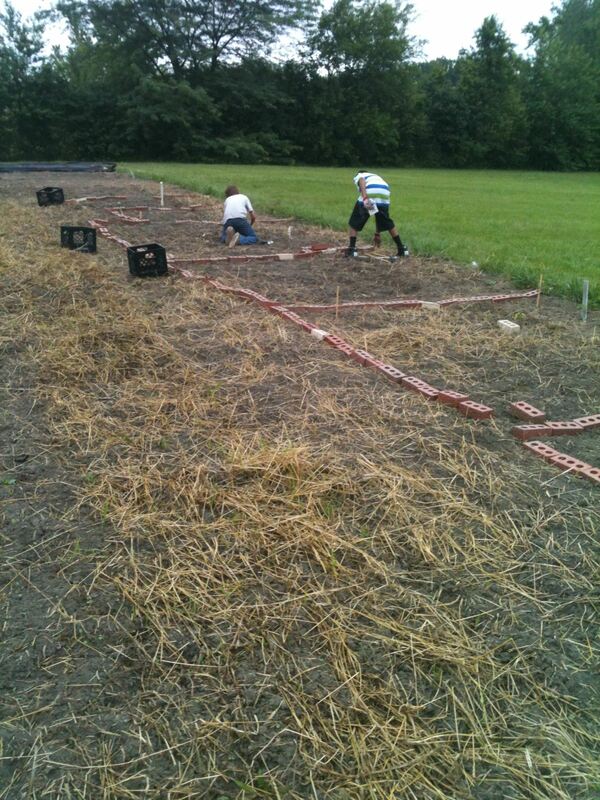 I have helped coordinate our Green Club (gardening / environmental club) and every year we take a field trip to Smits Farm and the owner, Carl Smits, talks to the members about how to grow flowers and vegetables from seed in a greenhouse, how he got started as a farmer, and how he has expanded his business. They learn about science, marketing, economics and good life principals to live by! I plan to coordinate with the Adopt-A-Beach organization this summer and have some of my students help pick up litter along Lake Michigan. 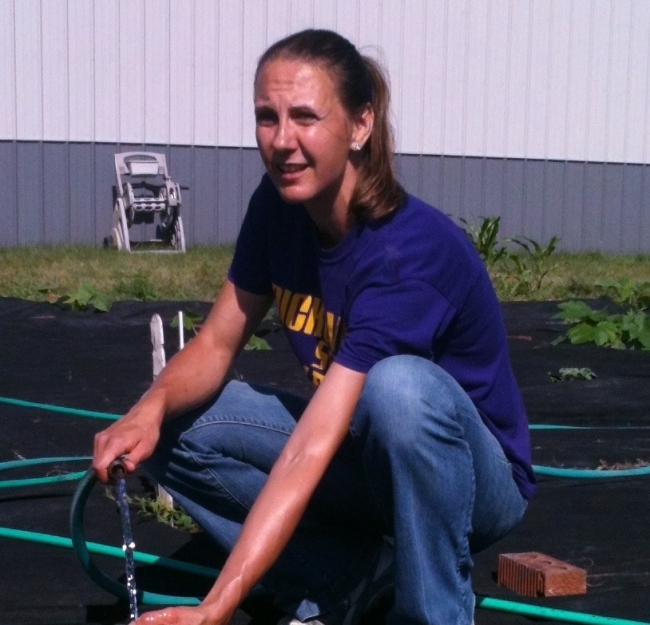 “I learned a stewardship ethic in the way I want to work more in the garden is because it is fun and I learn a lot more things. During the summer I helped grow pumpkins and on the Pumpkin Day, I was a leader for the event. 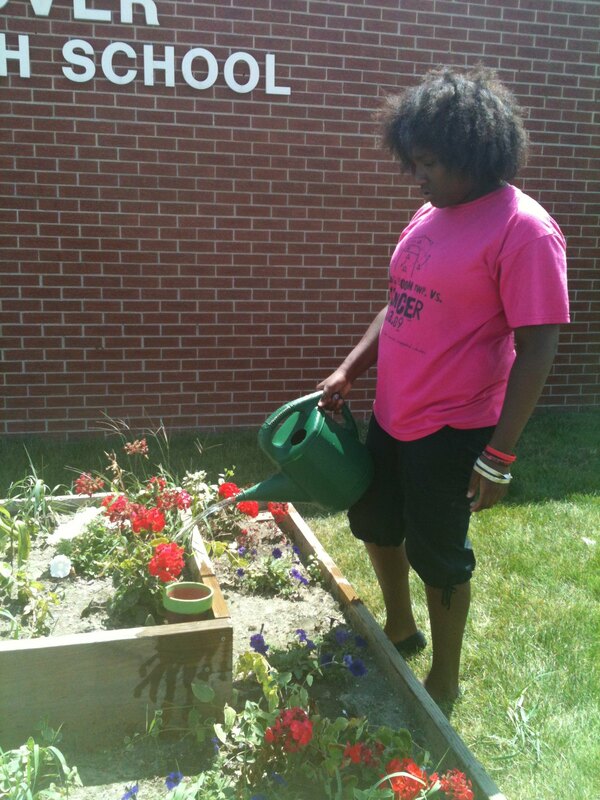 “I developed a stewardship ethic of helping the earth when I made a garden in Green Club during the summer. We also made a Pumpkin Day Bash, and we helped the 1st graders understand the meaning of taking care of the earth. “Throughout the years of being in Green Club, I’ve not only learned to develop a stewardship ethic, but to also develop leadership and determination. 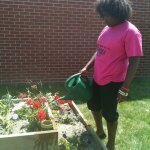 The events that took place during Green Club have influenced me to show the younger generation to care about the earth. In October of 2013, I was honored to be asked to participate in the 1st grade Pumpkin Day Bash event. 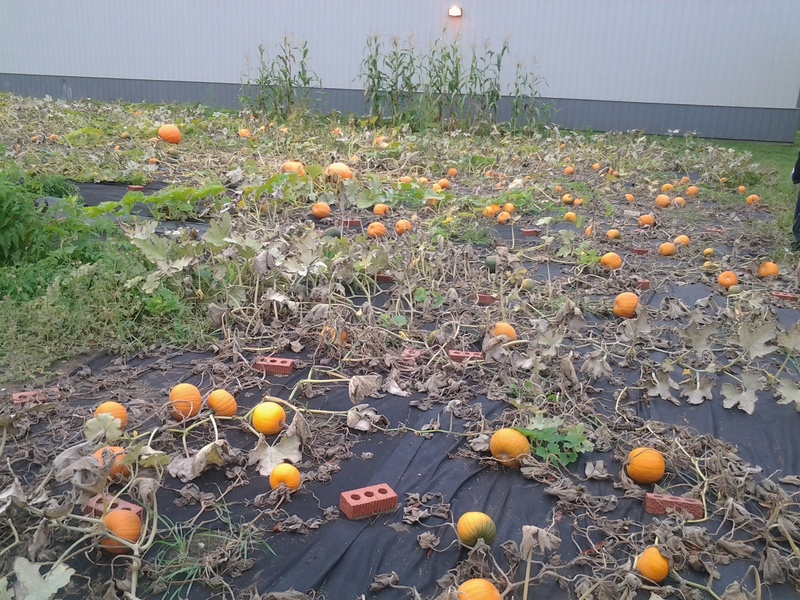 The 1st graders that visited Rickover from Wagoner Elementary School were very excited to pick their own pumpkins. At the end of the day, the 1st graders were begging to come back again. I felt really proud and accomplished when 1st, 6th AND 7th graders were saying how they wanted to join Green Club!